At this point, it seems President Trump will have little interest in museums or libraries, which could be good or bad, depending on your concerns. He’s neither shown great affection nor animosity towards them—unless they help or hinder him. His Foundation’s $100,000 donation and his 30-minute first-ever visit to the September 11 Memorial Museum in April 2016 seemed to be more of campaign event in the week before the New York Primary than an interest in 9/11 or the museum. His involvement with historic preservation serves as a possible model for his thinking. He’s notorious for demolishing an historic landmark (the Bonwit Teller store) to build Trump Tower and for rehabilitating another (the Mar-A-Lago estate) into a private golf resort (whose preservation easement with the National Trust for Historic Preservation provides a tax deduction). For the most part, museums and libraries aren’t on his radar, nor is history. For 2015, the most recent year the Form 990 is available for the Donald J. Trump Foundation, it held over $1 million in assets and gave nearly $900,000 away in grants ranging from $415 for the New Jersey Boxing Hall of Fame to $100,000 for the Marine Corps Law Enforcement Foundation. Most grants fell between $10,000 to $25,000 for law enforcement and health-related causes that were based in New York or Florida. There were a few small grants to theatres and schools but none were to museums, libraries, or history organizations. He doesn’t seem to read history books, explore historic sites, visit history museums, or serve on the board of any history organization. In September, he praised the new National Museum of African American History and Culture, but he had only seen it from the car window. For Donald Trump, museums, libraries, and history are like Manitoba. He knows it’s there but he has no compelling reason to visit, learn more about it, or support Manitoba’s interests but he’s not particularly against it either. If there was any museum he had take a particular interest, it was the National Museum of Catholic Art and Library in the 1990s, but at the time, it didn’t seem to be a museum, didn’t have much of a collection, nor any connection to the Catholic church (but it had soooo many troubles). The Foundation gave the museum $100,000 and various in-kind contributions, most likely to strengthen his relationship with Edward Malloy, who was museum’s chairman but more importantly, the head of the Building and Construction Trades Council of Greater New York. Sigh. The museum raised more than $9 million but quietly closed in 2010 with “few visitors and mounting debt,” according to the New York Times. 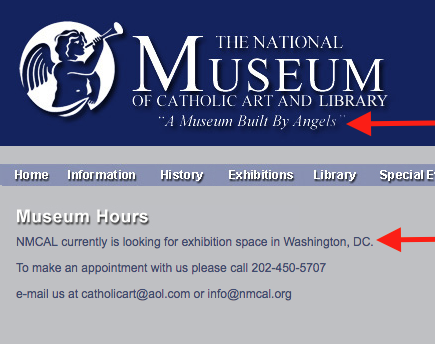 The “Museum Built by Angels” is “currently looking for exhibition space in Washington, DC”—perhaps the new Trump Hotel? 1. Appointment of the IMLS Director. President Obama nominated Kathryn Matthew as director in March and the Senate confirmed her in September, so she’ll be at the helm for a while. We should have no concerns until her four-year term ends in 2020, unless she decides to leave earlier (or if President Trump decides he’d rather have someone else as director). 2. Authorization and funding. The Museum and Library Services Act of 2016 (Senate Bill 3391) would allow the IMLS to exist for another five years and is currently being reviewed by the Committee on Health, Education, Labor, and Pensions. Sponsored by a nice bipartisan mix of Senators Collins, Cochran, Gillibrand, Leahy, Stabenow, King, Tester, and Whitehouse, this bill should be approved by the Senate. The House is more unpredictable, but it should eventually emerge. The big question is when? If after January 20, it’ll be on President Trump’s desk but will he sign the bill or veto it? His decision will probably be most affected by what’s happening to him that day. Okay, an extra $1 million in the budget is peanuts compared to the size of the federal budget, population of the US, and number of museums and libraries, but hey, in this Congress, it’s still swimming upstream so I’ll give him some credit. 3. Appointments to the National Museum and Library Services Board. On November 21, President Obama appointed six people to this board, but it may be too little, too late. 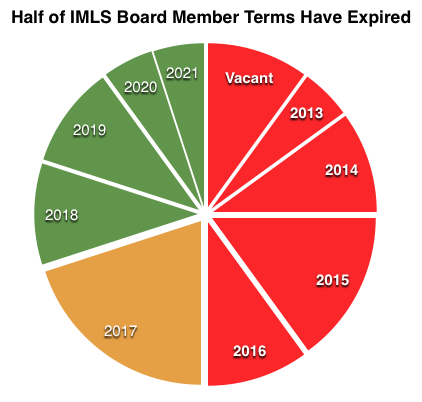 He just wasn’t making sufficient appointments during the last few years (it should have been four persons annually with five-year terms to populate the 20-member board). With two vacancies, eight expired terms, and four more expiring in 2017, the result is that most of the board can be replaced by President Trump in his first year in office. I’m not sure if he’ll do that given the thousands of appointments he’s considering and I suspect the grueling confirmation process of his cabinet appointees will consume most of his attention. However, it does suggest that the museum community needs to monitor this board as much as the IMLS authorization and funding process. In the meantime, the board members with expired terms will be able to continue to serve until their successors are appointed by President Trump. “Trump and the Truth: His Charitable Giving by John Cassidy in The New Yorker (September 24, 2016). “Trump Rejected From Visiting Civil Rights Museum After Rudeness, ‘Special requests’” on DiversityInc.com (September 27, 2016). “How Historians of Tomorrow Will Interpret Donald Trump’s Election,” Time.com (November 11, 2016) with comments by Stephanie Coontz, Jefferson Cowie, Tony Horwitz, Lynn Hunt, Elizabeth Hinton, James Loewen, T. J. Stiles, and Tyler Stovall. “Trump and the Arts: ‘Evita,’ Huge Towers and a Snub for Warhol,” by Randy Kennedy in the New York Times (November 18, 2016). “Donald J. Trump” by William Seale, White House Historical Association. “A Donald Trump museum? Atlantic City Historians Consider It” in the Houston Chronicle (December 3, 2016). Historians on Donald Trump, Facebook group. Eleanor Clift at The Daily Beast provides a background article on this Facebook group. Historians Against Trump (HISTAT), blog. Donald Trump’s uncle and MIT professor John Trump helped with the installation of the Theater of Electricity at the Boston Museum of Science and became a life trustee. December 15, 2016 Update: President Obama named three people to the National Museum and Library Services Board: Lynne Ireland (Deputy Director of the Nebraska State Historical Society), Mort Sajadian (President and CEO of Amazement Square), and Kenneth Schutz (Executive Director of the Desert Botanical Garden). Five more people to go to fill all of the expired seats! I would normally not point this out, but it changes the meaning of your sentence (I think). Thanks, that’s a key word in that sentence. I made the fix and also added an article on Trump’s history of philanthropy suggested by another reader. Trump has no reason to care about museums. They don’t advance anything he stands for…especially his “brand”. We must do what we have always done, keep our heads down, work hard, and protect our resources. A very useful analysis, Max. Thank you!